Kenta Maeda’s start to the season has been, to put it simply, pretty ugly. In four games so far, he’s failed to make it past the fifth inning; last night’s performance was the worst yet, allowing six runs and putting 10 men on base. Now, the Dodgers are saying that they might skip his next start in order to give him some time to work on his mechanics and reset. But the question of what, exactly, he needs to reset isn’t a straightforward one. Compared to last year, Maeda’s strikeout and walk rates have held fairly steady. He hasn’t had any dramatic swings in batted-ball luck. (A BABIP of .313, only slightly higher than the generally accepted league average figure of .300.) He’s using his sinker less and his regular fourseam fastball more, but not extremely so. There’s no meaningful change in his velocity or his release point. The biggest difference lies in his flyball rate: more than half of the balls he allows hitters to put in play, compared to last year’s measure of barely a quarter. What’s interesting is that there’s no one pitch responsible for this increase—with flyballs now coming almost equally from his fastball, his curve and his slider. And, most damningly, a ridiculous number of those flies are turning into home runs, with more than 20 percent of his flies becoming dingers. That kind of number isn’t sustainable, far worse than average, and it’s generally something that should regress as the season wears on—but if you’re allowing that many flyballs to begin with, then it doesn’t look particularly good either way. 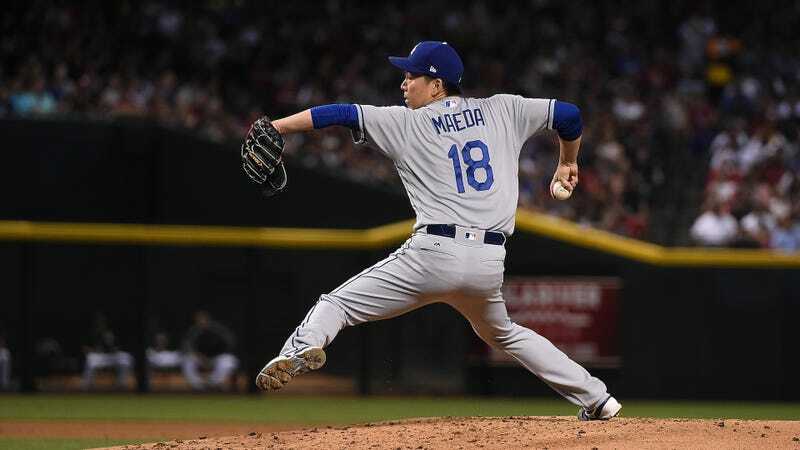 It’s hard to not think about Maeda’s health any time he struggles, given that red flags in his pre-signing medical exam led to a contract whose value comes largely from performance incentives. And for a Dodgers rotation that struggled with injury issues last season and has already faced more of the same this year—Rich Hill’s blister is back, Scott Kazmir’s hip has landed him on the disabled list—Maeda’s health and success might be crucial.